While these instruments aren’t the worst in the world, I’d hate to think of someone being fooled. 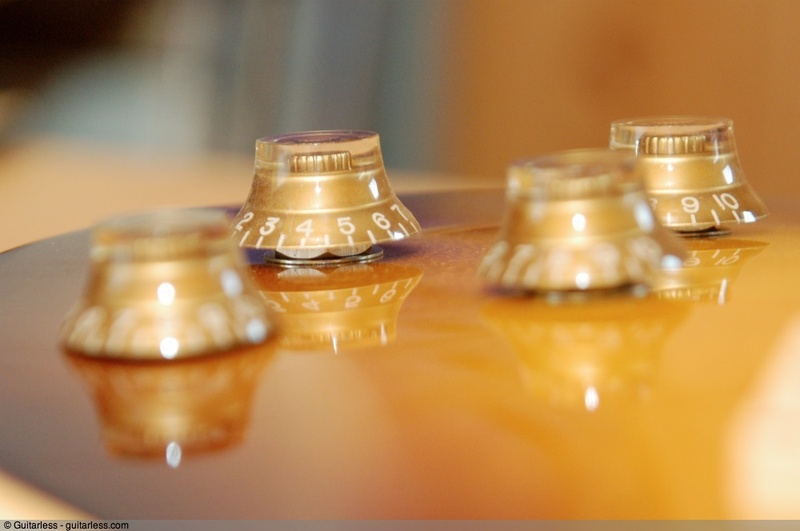 If you want to buy what you know is a fake Les Paul, while Gibson (quite rightly) won’t approve, go right ahead – you pays your money and takes your chances. My main concern is for those who don’t know they’re buying a phony Gibson. So, to try arm potential buyers, I’m supplementing the information (originally released by Gibson, I believe) that was mentioned in the previous article. That information is – I think – a little out of date now and could also do with some ‘topping-up’. As I had the dubious fortune to have a Chinese Les Paul copy through my workshop recently, I thought I’d take the opportunity to get a few photographs of the fake and compare to similar photos of a genuine Les Paul. Along the way, I’ve explained a little about what you’re seeing – I think understanding the reasoning behind the design choices of the counterfeiters can only help you in spotting a fake. It does mean the article is a little long however. You might want to grab a coffee. The fake Gibson image is on the left and the genuine Gibson on the right unless stated. Click each image for a larger view. 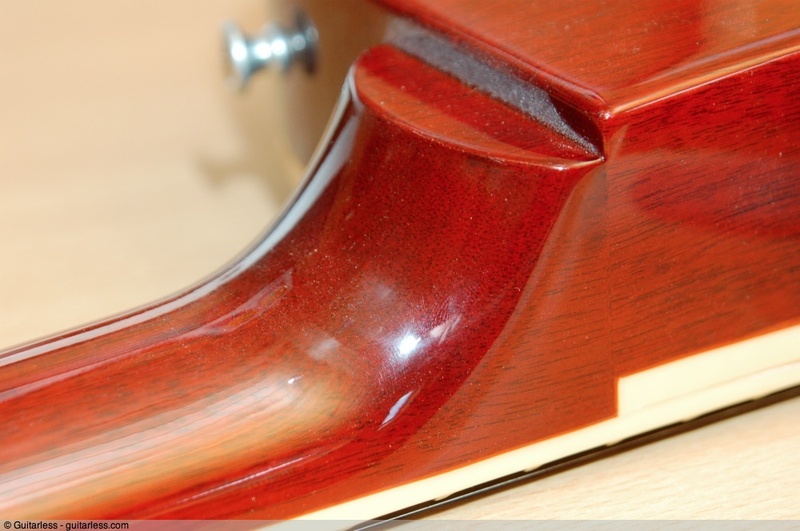 The majority of (although by no means all) Les Pauls have a neck that is cut from a single billet of mahogany. The neck is all one piece of wood. While this practice contributes to the dozens of Gibsons I get through my workshop every year with broken headstocks, it’s also a big part of the Gibson ethos. The problem for the fakers is that making necks this way is a very wasteful practice. There’s lots of wood left over that’s of limited use. Therefore, they tend to cut their necks from smaller billets and then glue additional wood to them to make up whatever’s missing. 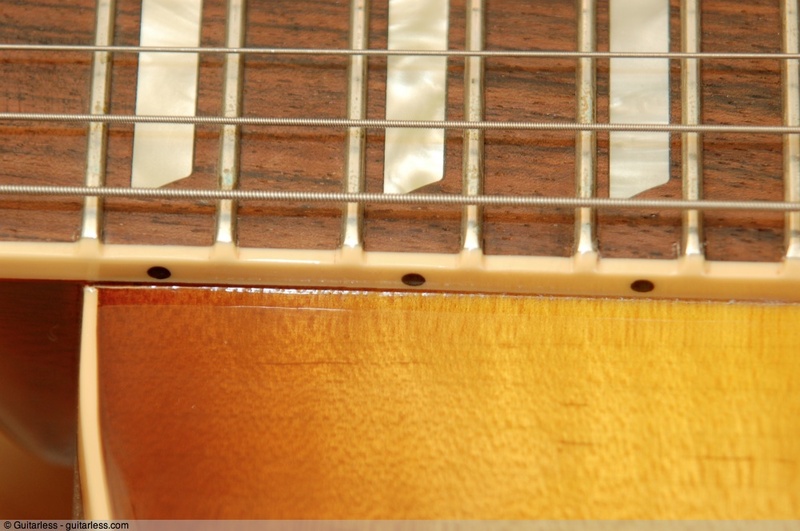 Above, you can see that the fake Les Paul on the left has had its angled headstock scarfed on. The joint between the two different pieces of wood is obvious. 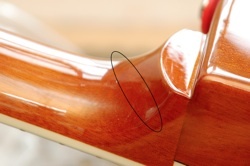 One thing to note (which confuses things very slightly) is that genuine Gibsons usually have the left and right edges of the headstock glued on from a separate piece of timber (you can just see this in the image on the right). 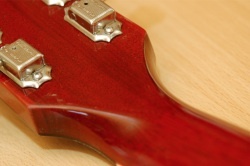 These headstock ‘ears’ are normal and not a sign of a counterfeit Gibson. The joint isn’t quite so obvious down at the heel-end but it is there. Further confusing things on this jointed-neck issue is the fact that Gibson’s history is sometimes a murky, foggy place. I’ve seen Gibsons with headstocks jointed just like the fake one above. I’ve seen Les Pauls with maple necks hidden under solid colour finishes that have been made from four or five jointed pieces of timber. A jointed neck should be considered a warning sign, however, and should make you look out for the less-obvious signs. 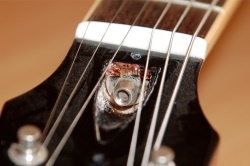 A spanking-new Les Paul should have little binding nibs at the ends of each fret along the neck. 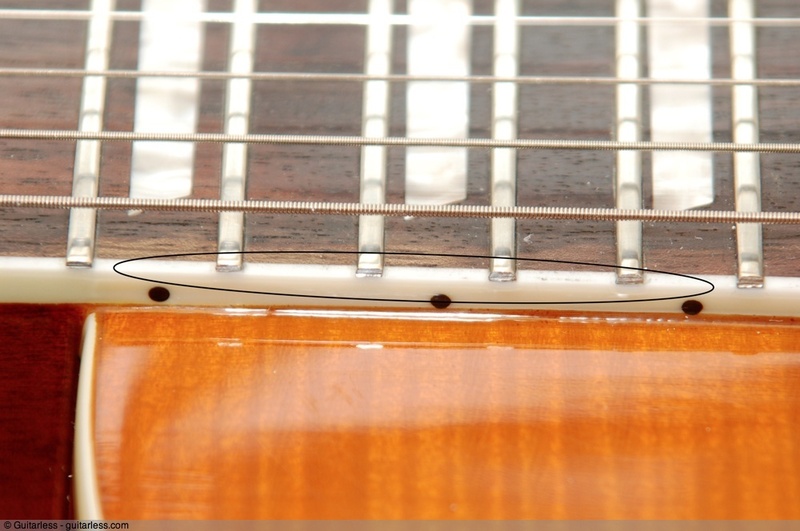 This is the result of the way Gibson fret their fingerboards and is a practice that isn’t followed anywhere else. 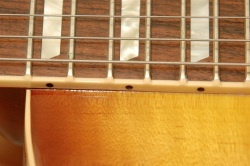 If the metal fret-ends go all the way to the edge of the binding, that’s a red flag. It’s worth noting that, if the instrument has been refretted at some stage, most likely, this will not hold. It’s incredibly labour-intensive to retain those nibs when refretting and most people choose not to (when they hear the cost of keeping them). 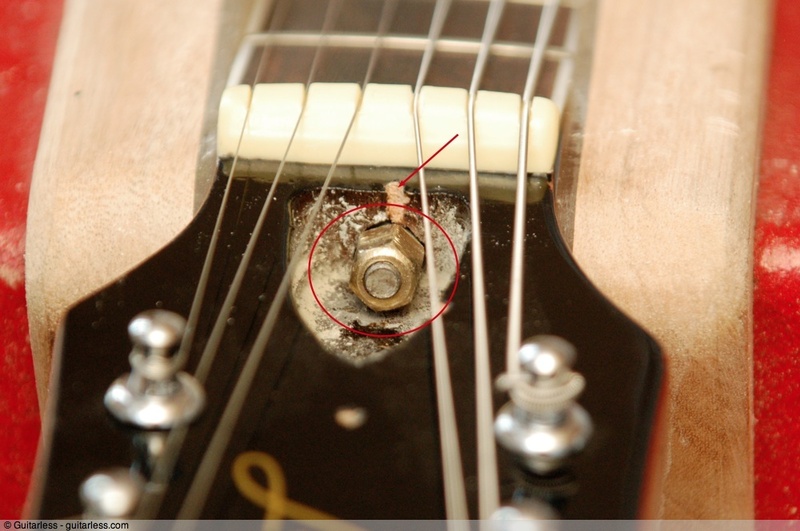 As mentioned in the last article, the truss-rod access used to be a giveaway for a knockoff Gibson. 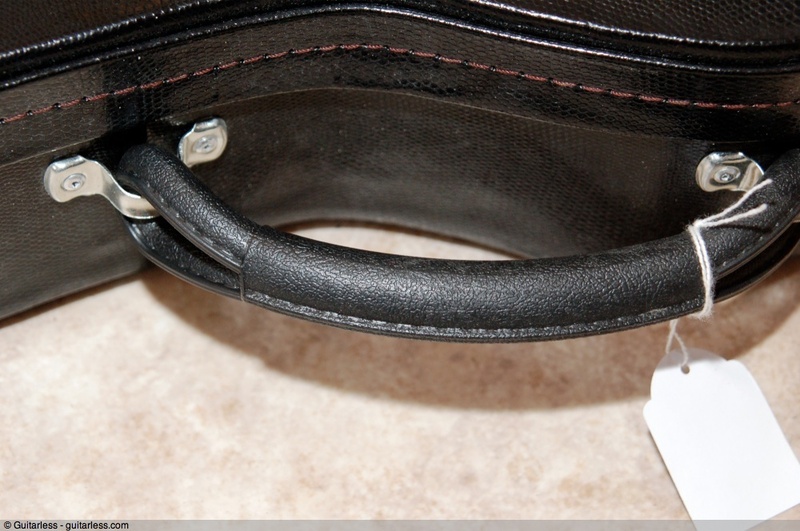 Typically, it was covered with a triangular(ish) plastic cover retained by three screws rather than the genuine two-screw, bell-shaped cover. Underneath, on the fake, was a narrow access channel rather than a wider, arch-shaped access. Well, it seems the fakers have gotten wise to this. 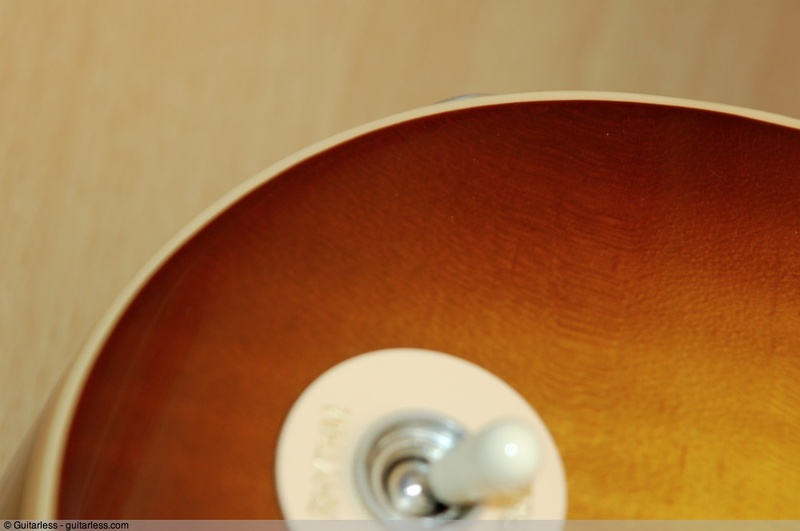 This fake Les Paul has a bell-shaped cover, held in place by two screws. Underneath, it has a large access cavity. At first glance, it looks pretty similar. There are a couple of alarm bells ringing though. 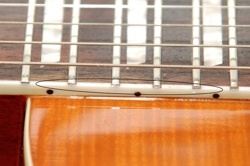 The arrow in the fake Les Paul image on the left shows that the two screw truss-rod cover doesn’t quite fit – the fact that the screw hole is mostly air is testament to that. The truss-rod nut itself is not the right shape. While we may be getting a little geeky here, it’s very different to the more curved, ‘acorn’ shape of the original. Lastly, between the nut and the wood of the neck, there is no ‘half-moon’ washer. The washer is there to spread the load when tightening the nut – without it, there is a risk that this fake’s nut will just tighten into the wood of the neck. It looks fine from arm’s length but take a close look at the logo on this pirate Les Paul and you can see the difference. It doesn’t take a graphologist to tell you that one of these isn’t right. The forgery is less graceful (for want of a better word). 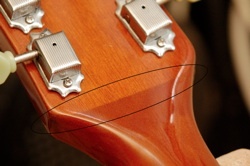 The phony Les Paul logo is a consistent thickness – they haven’t been able to replicate the thick/thin, calligraphy style of the genuine logo – and looks obviously incorrect when compared to the original. Nigel Tufnel wouldn’t be fooled. Take a look at the top of the dodgy Gibson. Rather than give you a wonderfully beautiful – and wonderfully expensive – flamed maple top, the counterfeiters will save money by faking it. A photo-finish is the method used. The flame you see in the top of the leftmost image above is not there – it’s, essentially, printed on. It looks pretty good and, to be fair, it’s a legitimate technique used on budget instruments all over the world. There’s no problem as long as the seller doesn’t try to pretend it’s AAAAA-grade maple under that finish. Along the edge of the top, there are places where the ‘printing’ hasn’t quite reached the edge. You can see the flame stop before the binding. Giveaway – but one that’s not always there so beware. 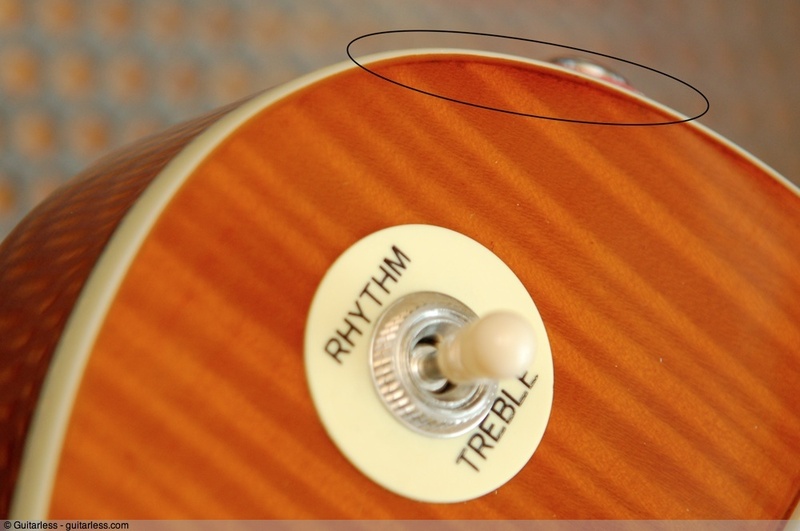 This isn’t something I’ve noticed on the Chinese Fake Les Pauls before (although it may have been there). The volume and tone controls appear to be mounted at right-angles to the back of the guitar. Because there is a curve on the top though, this means they don’t sit quite right – closer to the wood on one edge than the other. On the real Gibson, the controls are at right angles (more or less) to the curve. 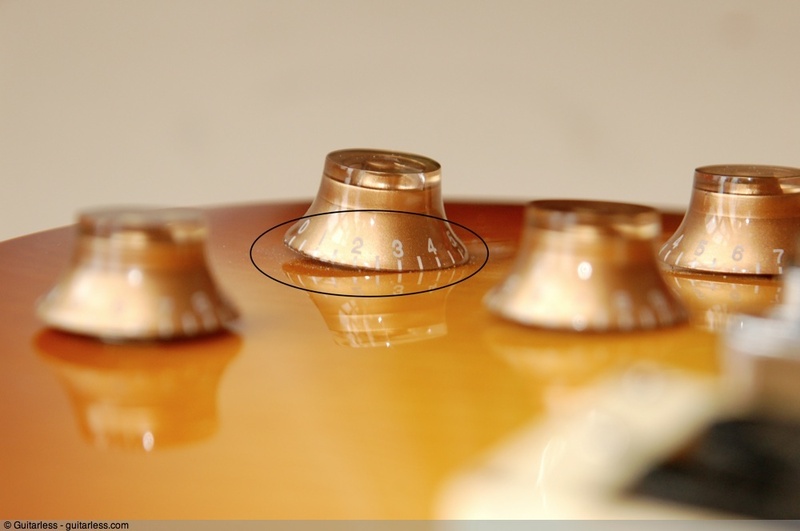 From a tooling point of view, this makes sense on a cheap forgery and I’d be willing to bet it is consistent on lots of other Les Paul fakes. Keep ’em peeled. 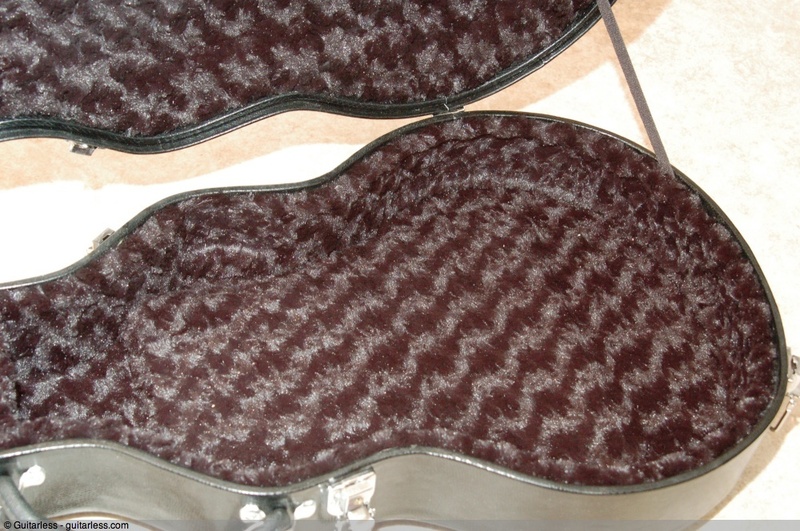 Lastly, the guitar case. Again, the knock-off artists have been paying attention. This fake guitar comes with a Gibsonesque hard case. The Gibson features of this case are only skin deep though. All of these images are of the fake Gibson case, by the way. 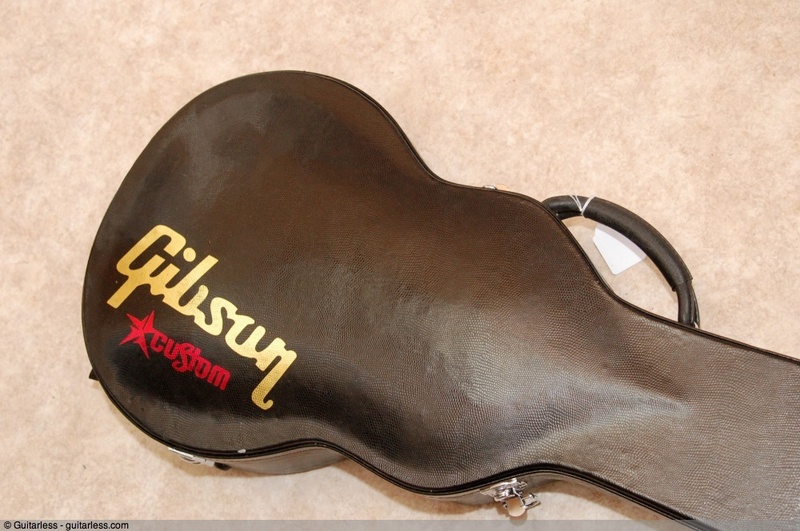 The fake case is just a cheap, generic, hard-case that’s had a Gibson logo screen-printed on. It’s not as sturdy as a real Gibson case. It has a moulded rubber handle with some flimsy looking brackets to retain it. Inside, it’s got some unpleasant nylon hairy stuff – it feels and looks cheap. Lastly (and possibly it’s just this example) the whole exterior has a nasty, sticky feel – like some sort of lacquer covering. There are plenty of dodgy Gibson guitars out there. If you know you’re buying a fake and are happy to do so, fine – it’s not ideal, but it’s your money and conscience. These aren’t necessarily ‘bad’ guitars but they are definitely budget guitars and they are definitely not Gibsons. There’s far too much potential for innocent guitarists to get ripped off and, hopefully, this article will go some way towards preventing that. In conjunction with the information already out there from Gibson, this should help paint a broader picture. It’s worth bearing in mind the provisos mentioned throughout the article – some of them, on their own, aren’t definite proof of a fake but should be sufficient to make you wary and more questioning. Remember also, that, if buying from the internet, you may not be able to properly check all of these items. Caveat emptor. Let the buyer beware. It’s worth remembering the ‘if it sounds too good to be true…’ maxim. If you’ve any questions, shout ’em out below or drop me an email. I think this is an important issue so feel free to tell your friends. Feel absolutely free to use these images on your forums, blogs, sites, whatever. There is a copyright notice on the larger ones but that copyright is Creative Commons (Attribution, No Derivatives). This means that you can throw these images around wherever you want as long as you include a link back to this article and don’t alter them. So, like I say, feel free to share this information and help prevent people getting ripped-off. Thank you kindly, Stratoblogster. Why aren’t you in my blogroll? I’s not like I haven’t lurked around over at yours. Taking care of that right now while making mental note that I really should sort out that blogroll to fill it out some. I can tell you that the Chinese are getting better and better at this though. I was hired to photograph a few dozen guitars and many of them were “Gibson” Les Pauls. Granted I am a photographer by trade however like most men my age I had visions of becoming a rock star in the Late 70’s and I just happen to have a Les Paul (and a Telecaster… But I digress)in my closet I still take out every now and again and make some noise for my kids. Had I not been told after the shoot was done that they were indeed copies from China… I would have never known. These had correct binding at the nut and over the fret as shown here and the pots were set properly. As to the case or the guitars internals I did not see. Thanks for that. Interesting news. And inevitable, I guess. It seems likely that it will get harder and harder to tell the originals from the not-so-originals as the fakers up their game. We can hope that, instead of (mostly) uselessly railing against the counterfeiters, Gibson considers whether there are (intelligent) cost cuttings that can make the differential between a fake and the genuine article a little less. The smaller the difference in cost, the less likely someone will knowingly buy a fake – and I’d bet that a hell of a lot of fake purchases are eyes-open buys. I’m just trying to help prevent anyone getting unwittingly scammed.